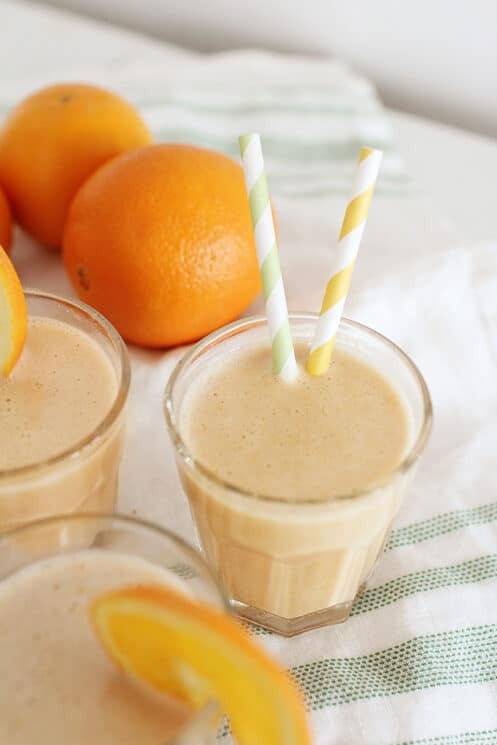 Serve up a fresh glass of vitamin C, protein, and real fruit with this healthy Orange Julius recipe made from simple whole food ingredients. Just what is it about an Orange Julius? That sweet, cold, and frothy treat famous at malls and state fairs across America has a way of staying in your mind, even if you’ve only ever ordered one or two. In this cold classic treat, we saw an opportunity to create a healthy dessert (or breakfast!) for kids that delivers two servings of fresh fruit, a boost of vitamin C, and even a few grams of protein for their growing bodies. Got frozen bananas and a few other basics on hand? 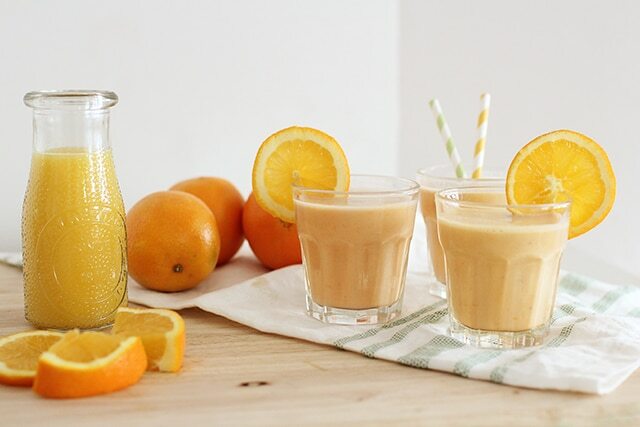 Then you can be sipping on this burst-of-sunshine Orange Julius recipe in five minutes. You have to try it! 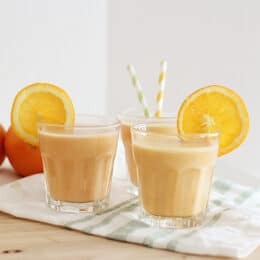 What is this Orange Julius Recipe Made Of? 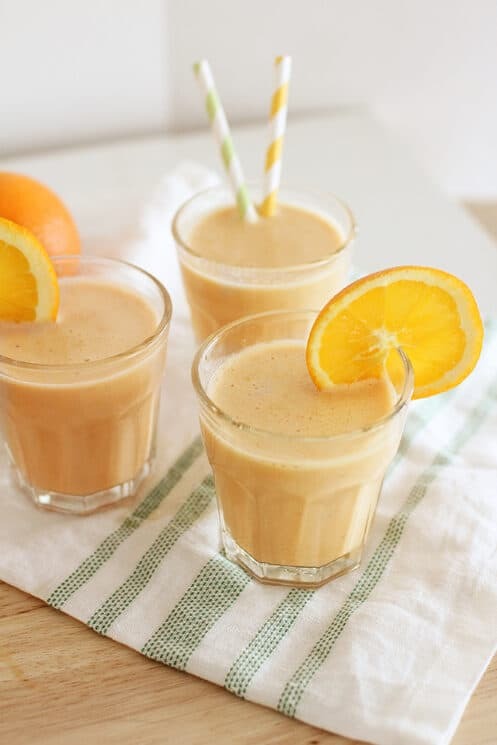 Toss these goodies into a blender and you’ll create something like an old-fashioned Orange Julius, only better: a cool and ultra-refreshing citrus drink that tastes a lot like a Creamsicle. And take heart: this recipe makes enough for you and your kids, both. 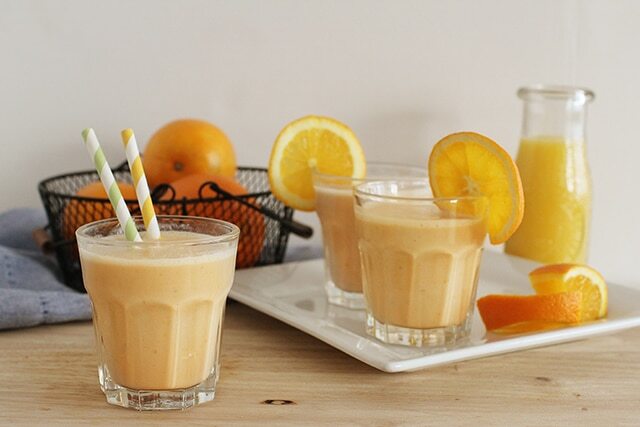 Other copycat Orange Julius recipes on the web use frozen orange juice concentrate to get that intense citrus flavor. We chose to get that kicky orange taste another way: with zest! A microplane zester like this one works perfectly for the job, but you can also use the fine holes on a box grater to get orange zest, too. By using a combination of zest and orange juice, we’ve been able to create a deliciously potent orange flavor that will keep your kids sipping… without the sugar rush that can come out of using canned concentrate. 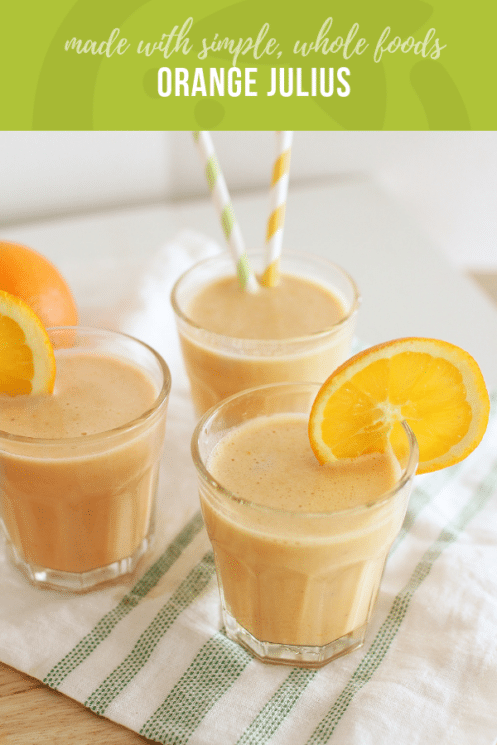 And if you love smoothies with an orange juice base, you’ll also love our Cherry Pineapple Smoothie. Happy sipping! Using a high powered blender, add orange juice, yogurt, vanilla, chopped banana, zest of one orange, and honey. Blend together well. If a thicker consistency is desired, add ice. I used to have an “Orange Julius” type recipe. Maybe it was in Make A Mix Cookery or somewhere else. I’ll have to search for it. I know it had powdered milk in it. Yum! Thanks for sharing! Hope the weekend was fantastic! Oh yummy! I’m so excited about this recipe! Healthy and delicious! Those sound great! I have some tangerines shriveling on my counter now – this will be a good use for them! I’m not sold on stevia. I think that in small quantities it’s probably just fine, but I have concerns about it being used in large quantities – you know, the way we Americans seem to prefer to do things. To each his (or her!) own, though! I agree Cathy! Like I said, we are trying to eat less sweet all around, so substitutions aren’t likely to help. But I’m curious what you know about Stevia. It was hard for me to find any un-biased opinons. My DH often busts me with the whole “I can smell it on your breath!” thing. I can’t get away with anything anymore. I’ll have to try the Stevia. I keep looking at it in the store, but just couldn’t commit. Where’s the zest in the recipe? It’s not listed in the ingredients. Did you use 3/4 cup orange juice, plus a whole (peeled) orange, plus the zest of one orange? Hi Faith! Thanks for pointing this out. The zest is supposed to come from the orange in the recipe, and you won’t need to use the flesh of the orange. This wasn’t totally clear in the recipe, so I updated the ingredients. I read your post Broccoli Mashed Potatoes and I really liked it so thought of to read more post.You write so well,Seriouslly.